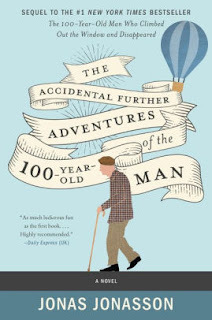 I wasn't able to get The Accidental Further Adventures of the 100-Year-Old Man by Jonas Jonasson read and reviewed in time for my stop on its blog tour, so you're getting a spotlight today instead. I haven't read anything by Jonasson, but his books certainly sound delightful. Have you read them? What did you think? I plan on starting this one tonight so that I have it done for Wednesday of next week, which sounds like plenty of time, but somehow things always get in the way.